Kasey O’Horo is a Senior Archaeologist and the Laboratory Director for the Far Western Desert Branch. 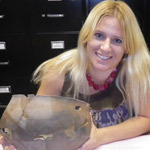 Kasey has a wide range of regional and international archaeological experience, with a current focus on southern Nevada and the Great Basin. Her recent projects include survey, evaluation, analysis, data processing, and curation for the Bureau of Land Management, Fish and Wildlife, Bureau of Reclamation, National Forests, and various military installations in western Utah, California, and Nevada. Kasey received her M.A. from the University of Nevada, Las Vegas, in 2008. Her graduate research focused on technology and production of Neolithic stone tools in Cyprus. Kasey has a keen interest in artifact analysis and curation. Laboratory projects range from processing newly evaluated collections through museum submittal to re-curating old collections to bring them up to current museum standards. Characterizing the Chipped Stone from Kritou Marottou Ais Yiorkis, Cyprus: Investigations into the Cypro-PPNB. Master’s Thesis. University of Nevada, Las Vegas. A Preliminary Note on the Chipped Stone Assemblage from Kritou Marottou Ais Yiorkis, an Aceramic Neolithic Site in Western Cyprus. Neo-lithics 1/03:21-24.